Let's get one thing out of the way: This is a really important album. For two reasons, firstly Missy Elliot is definitely the best female rapper around, she's quirky and interesting, but most importantly Timbaland's production is the template for most R&B/Hip-Hop albums and it is a sound that has come to dominate the charts. That being said it is not the best album ever, it is fun and all but as a result of having listened to so much similar stuff after it is not really surprising listening to it now. 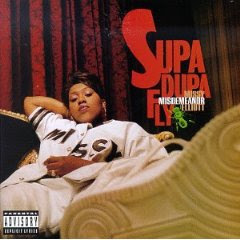 The best thing about it are really Missy's lyrics. She's a weirdo. So a very important album and one which definitely deserves to be a part of this list, this is, however, in some few cases not equivalent to an album that I would like to listen to everyday from here to doomsday. It is entirely produced by her associate Timbaland and features the hit singles, "The Rain (Supa Dupa Fly)", "Sock It 2 Me," "Hit Em Wit Da Hee," and "Beep Me 911." Other guest appearances on the album include Busta Rhymes, Ginuwine, Lil' Kim, Aaliyah, Timbaland, and the debut of Nicole Wray.